Review:This DVD set was released to celebrate the 50 anniversary of rock-n-roll along with Aloha From Hawaii special deluxe edition DVD. Here we have all the material shoot in the end of June 1968. This is no doubt the best Elvis DVD release at the moment. Great DVD design with 12 pages booklet makes this product worth buying. The producers did not re-edited and re-mastered the video, as they did on Aloha From Hawaii special deluxe edition DVD, but this is really does not spoil the whole thing. I can't say nothing bad about this release: they really put EVERYTHING all together, all unedited and uncut. All the takes and all the material we ever dreamed about! This tapes circulated on video tape, but in very inferior picture and sound quality. Now we have them in best condition ever possible! 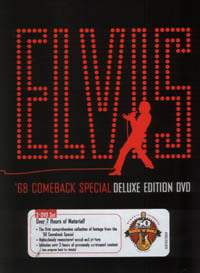 This DVD set is a must-have for every Elvis fan. Keep doing the good job, BMG!